UK Car Discount has excellent deals on brand new Renault cars across the model range. All vehicles come with full manufacturer’s four-year warranty and delivery in mainland UK. Buyers will be the first registered keeper. UK Car Discount is one of the UK’s leading online new car dealers established since 2003. Expression+ models features 16" silver alloy wheels, body coloured bumpers and door handles, front fog lights, light tinted windows, automatic headlights and windscreen wipers, electric front windows, air con and Radio/CD with Bluetooth and USB support. Dynamique MediaNav models feature 17” alloy wheels, chrome headlight surrounds and body trim, leather steering wheel and gear knob, chrome and gloss trim interior, automatic climate control, front electric windows , automatic headlights and windscreen wipers, MediaNav multimedia system with 7” touch screen and integrated sat nav, 4x20W Arkamys CD/Radio with Bluetooth and USB support. Dynamique S MediaNav models add to the Dynamique Media Nav model the following: 17” alloy wheels with black, ivory or arizona inserts, body coloured rear parking sensors, choice of coloured interior trim pack, exterior gloss pack (choice of colours), diamond black roof and door mirrors, electrically adjustable, folding, heated door mirrors and tinted rear windows and tailgate. 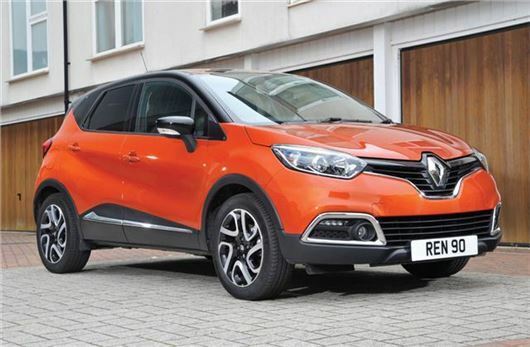 Browse more Renault Captur deals on the UK Car Discount website. Expression+ models feature 16" alloy wheels, air con, 2 x 20W radio with Bluetooth and USB support, front electric windows and front fog lights. Dynamic MediaNav models add the following to the Expression+ : 4 x 20W Arkamys radio, MediaNav multimedia system wirth 7" touch screen and integrated sat nav, leather steering wheel, black gloss and chrome exterior trim. Dynamique MediaNav S models add the following: 17” alloy wheels, automatic climate control, rear electric windows, body coloured rear parking sensor, electrically adjustable, folding and heated door mirrors. Browse more new Renault Clio deals via the UK Car Discount website. More Brand New Renault Scenic and Grand Scenic deals are available via the UK Car Discount website.